On May 16th and 17th I made my spring trip to Crex Meadows. I usually vary the trip time each year. This year I wanted to see the newly hatched goslings. Highlights of the trip were the goslings, watching a controlled burn in the meadows, Sighting a family of beavers and an encounter with a black bear. Although I didn’t get any great shots of the goslings they were sure fun to watch. 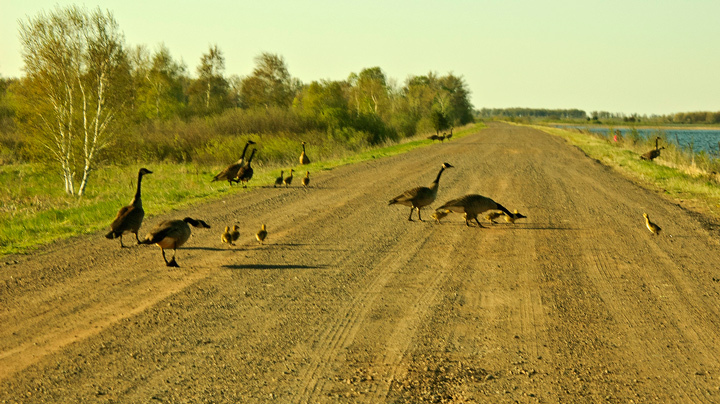 For some reason they like to congregate on the dike roads that run throughout Crex Meadows. When a car comes down the road they wait until the last minute and then run in every direction. It reminded me of an old time silent movie skit. They would usually end up in the water only to return to the road shortly after the car drove by. In one case the parents flew into the flowage leaving the goslings to scramble over the grass and brush to get into the water. This is a shot through my windshield as I approached some geese. 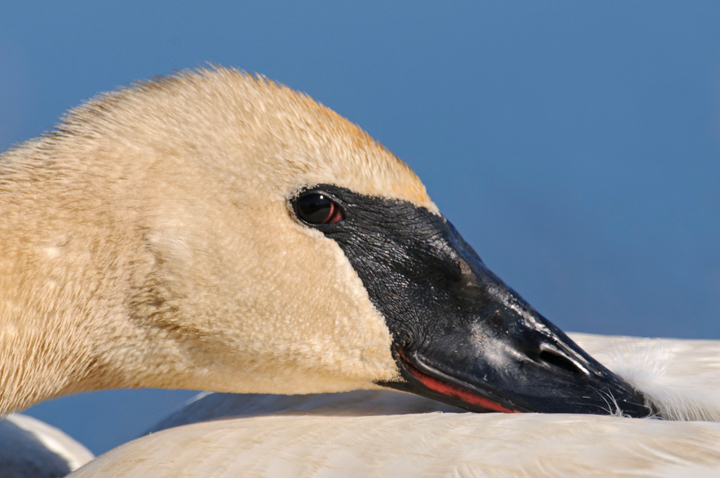 I noticed some Trumpeter Swans in one of the flowages and stopped to take some photos. Just as I drove up a pair of Canada Geese and their goslings entered the water near the swans. One of the swans was upset and went after one of the geese. Unfortunately I was only able to capture the end of the encounter. I noticed that a controlled burn was taking place because I could see the smoke for miles. 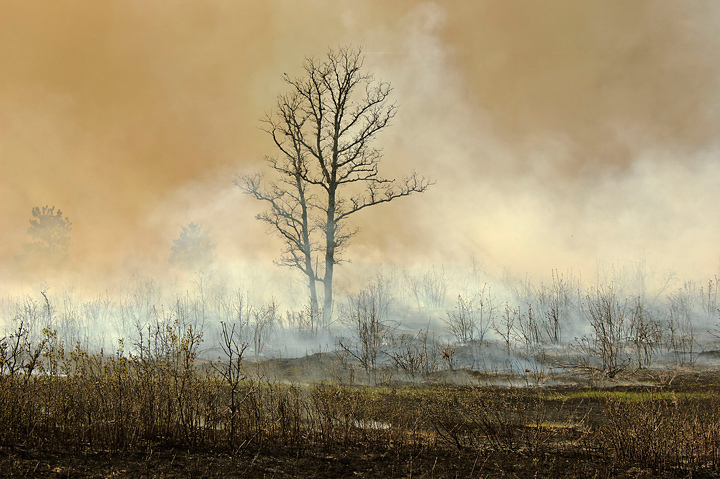 As I drove on the various dyke roads I managed to drive through the area they were burning. Lots of equipment and people conducting the burn. I had hoped that it would continue through sunset so it would create a nice glow but it didn’t. Normally I like to plan my trip to Crex Meadows to coincide with the full moon. 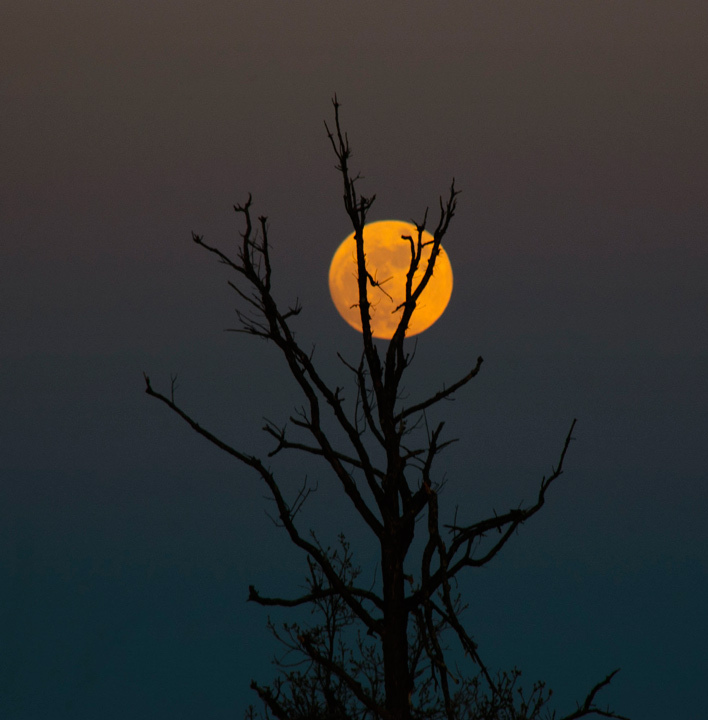 In this case I noticed that the full moon was a couple of days away and more importantly the moonrise and sunset were within a few minutes of each other. It makes it handy to capture both if the weather cooperates. Unfortunately it didn’t on this trip. There wasn’t a cloud to be seen. Even worse I was looking for a new area to photograph the sunset and it didn’t work out and so I was out of place to photograph the moonrise. I did manage a few shots but nothing spectacular. I normally say in Grantsburg overnight so I can photograph the sunrise. Again it was a disappointment because there were no clouds to be seen and there were no birds on Phantom lake. 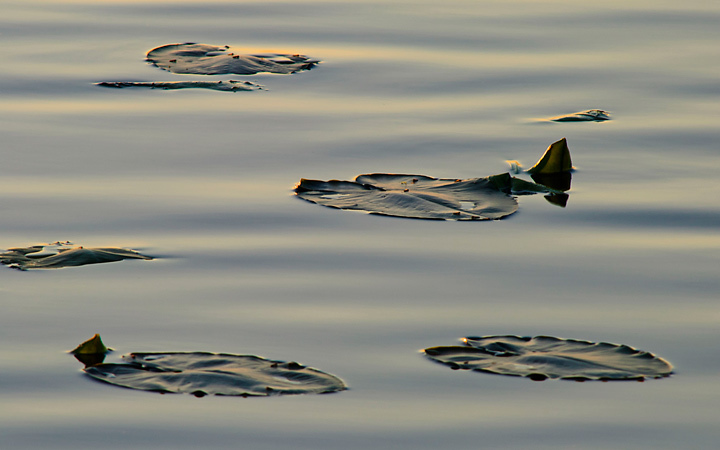 However, I did manage to get some nice backlit photos of lily pads and reeds. 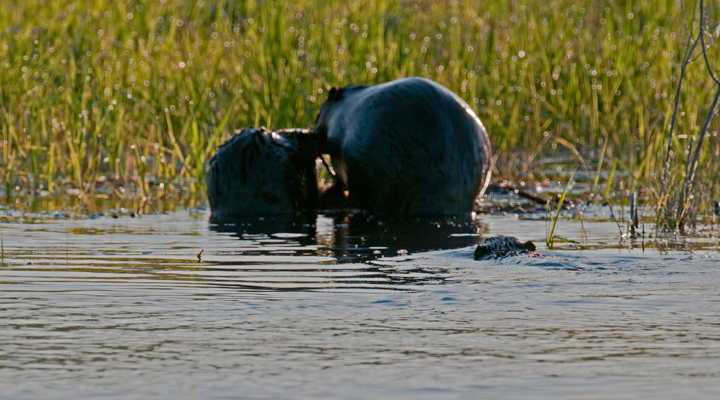 Driving past one of the canals in the wildlife area I noticed several beavers swimming down the canal. I drove along a parallel road and was able to get ahead of them. I setup the camera and waited for them. Unfortunately they were backlit but when they reached me they went up on land. Turns out it looked like a family. The adult was on shore and the two smaller ones swam up to it. Watching them swim I didn’t realize how large they are. I then headed drove through the burn area on my way to the sand blow. There were still logs and stumps smoldering. 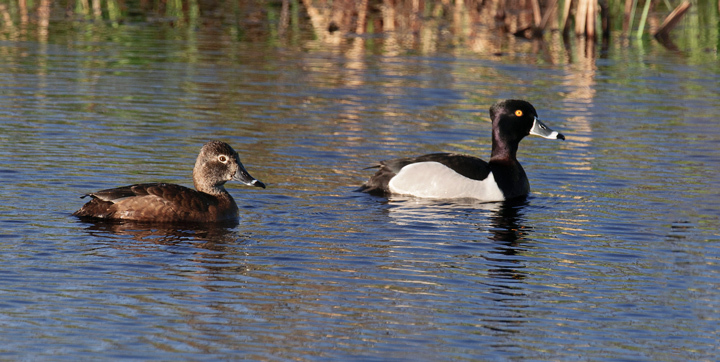 Just as I started my drive through the burn area I found a pair of Ring-necked Ducks in a small pond. As I watched them a Mallard Duck came out of the reeds and started after them. Shortly thereafter I had a surprise encounter with a large black bear. I was driving along the road at about twenty five miles an hour in a place I didn’t expect to see any wildlife when all of a sudden a large black bear charged out of the swam right in front of the car. He hit the road running full speed headed down the road in front of me. I was so surprised I didn’t even have time to hit the brakes. I followed him for about seventy five yards before he veered off the road into the swamp. You might think I got a great picture having three cameras sitting on the passenger seat. But I was so startled that I forgot to grab a camera as I followed the bear down the road at twenty five miles an hour. 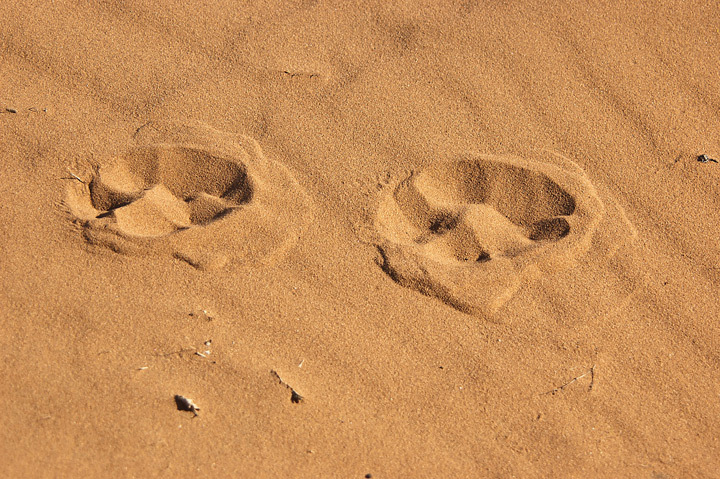 At the sand blow I managed to photography what appears to be some wolf tracks. I never know what I’m going to find at the sand blow. Last year I found some fresh bear track. 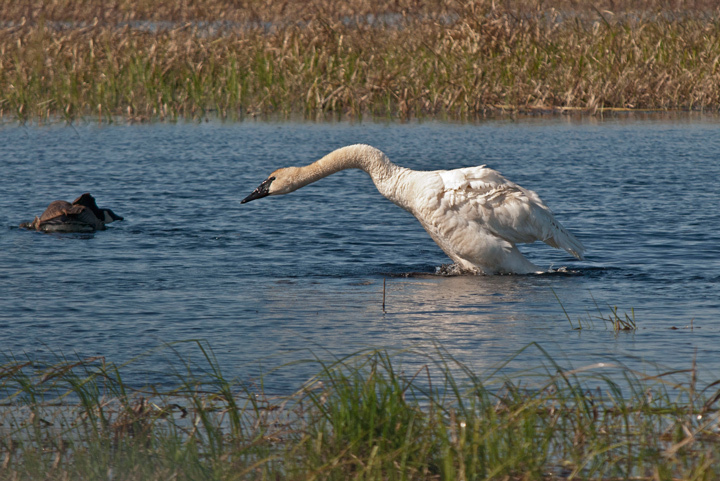 Driving out of the meadows I found a pair of Trumpeter Swans along the road. I typically don’t find them in the road and even when they are close to shore they usually move out into the water. This pair wasn’t about to move. They held their ground. On my way back home. I stopped at the Fish Lake Wildlife Area to watch some birds. As I watched several Canada Geese in the water another goose flew down and landed on top of one of the geese I was watching. It pushed it entirely underwater. I had never seen anything like this. The goose popped back up and they swam off together. All in all it was a successful trip with the fire burn and bear encounter. Crex Meadows is a great place to photograph wildlife because of the extensive dyke road system that allows you to photograph from the car without disturbing the wildlife.